Robert Gunn died at Post Office House Lybster 5th July 1917 aged 70. Son L Corporal Peter Gunn 5th Seaforth Highlanders died at Festubert France 15th June 1915 aged 34. Sons Peter Cormack and John Bruce died in infancy. 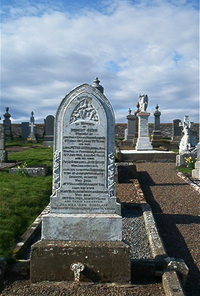 Daughter Davidina Gunn died 27th March 1924 aged 34 wife of John Sutherland chemist of Lybster. Wife Mary Elizabeth Sheppard Cormack died 26th November 1932 aged 83. Daughter Joanna Ann Sinclair died 16th March 1954 aged 75. In loving memory of Mrs J Sutherland from her late pupils Lybster H C School.